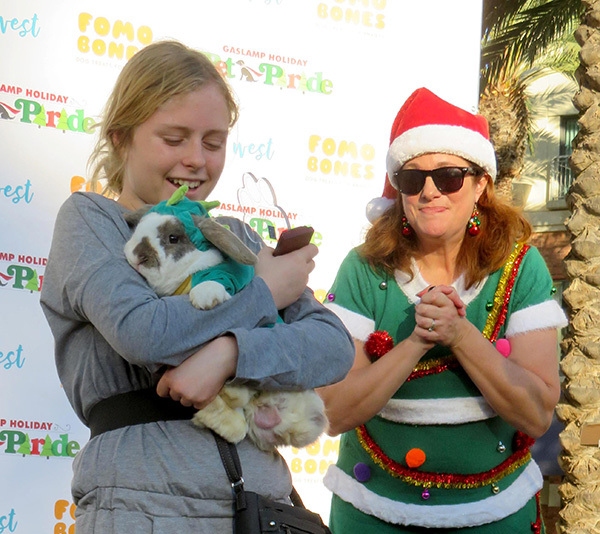 The Vet + Pet West Gaslamp Holiday Pet Parade rolled into the Gaslamp on Dec. 16. This was the 11th year for this holiday event, presented by Fomo Bones. Dogs in all shapes and sizes met at the Martin Luther King Jr. Promenade in Downtown. 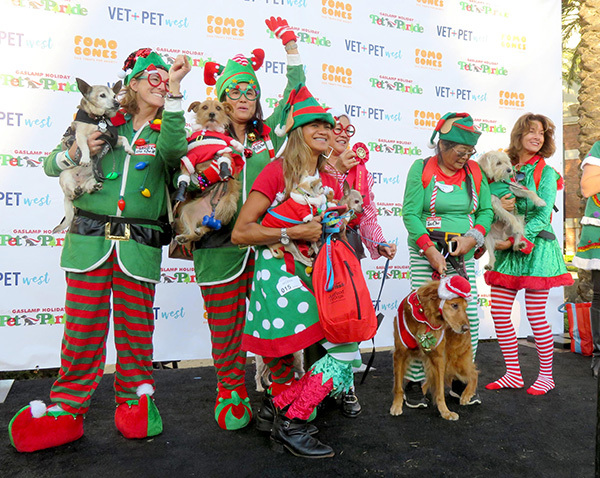 Canines dressed in holiday costumes along with their owners. Other participants came with rabbits, tortoises, cats, pigs, and chickens. When attendees arrived, they could visit the Holiday Pet Expo with a chance to win terrific gifts by collecting stamps from all 18 pet vendors. The parade began underneath the Gaslamp Quarter Archway. The 2018 Grand Marshal was Lucy the Boston terrier, with owners George and Teresa Pisano leading the way. Surf Dog Ricochet was awarded the Greyfrairs Bobby Award and could be seen riding in an old 1924 Ford Model T. The La Jolla High School Marching Band was a new addition this year. Streets lined with spectators cheered everyone on as they marched up Fifth Avenue and then back down Fourth Avenue to the Hilton Gaslamp Park. Winners of the pet parade were announced on the stage. Sponsors included Blue Buffalo and Love on a Leash. Megan Parry, KGTV Channel 10 meteorologist, was the emcee for the awards. The winners for Best in Show were: third place — Suki with handler Jeanne Patten; second place — Lucy with handlers George and Teresa Pisano; and first place and Grand Prize Winner for the 2019 12th annual Pet Parade was — Bailey with handler Mary Caraway. The Best Ugly Holiday Sweater Award went to third place — Gunner with Handler Zach Miner; second place — Chune with handler Kelly Gomez; and first place — Buddy with handler Joe Minner. The Cutest Critter went to: third place — Mila, aka Meal Deal, with handler Jessica Sherman; second place — Geronimo with handler Celia Schmidt; and first place — Olive with handler Katie Sullivan. 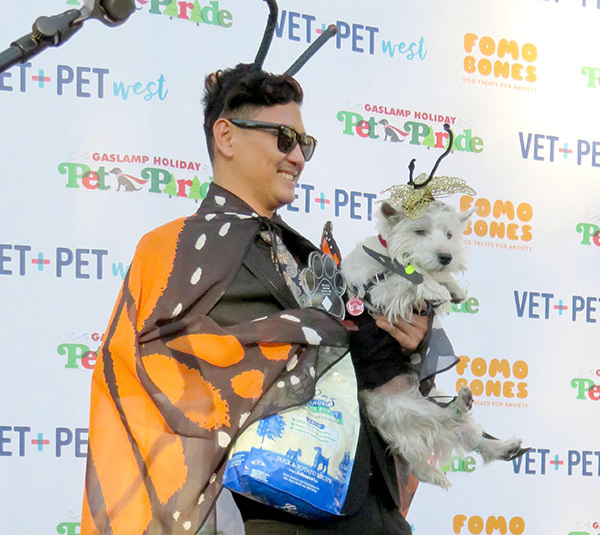 The Best Pet Costume went to: third place — Missy with handler Terri Pobre; second place — Bismark with handler Mara Serpa; and first place — Suki with handler Jeanne Patten. Best Costumed Duo: third place — Mizzou with handler Robert Ivey; second place — Derby with handler Kentucky Gallahue; and first place — Tia with handler Jaime Miguel Flores III. 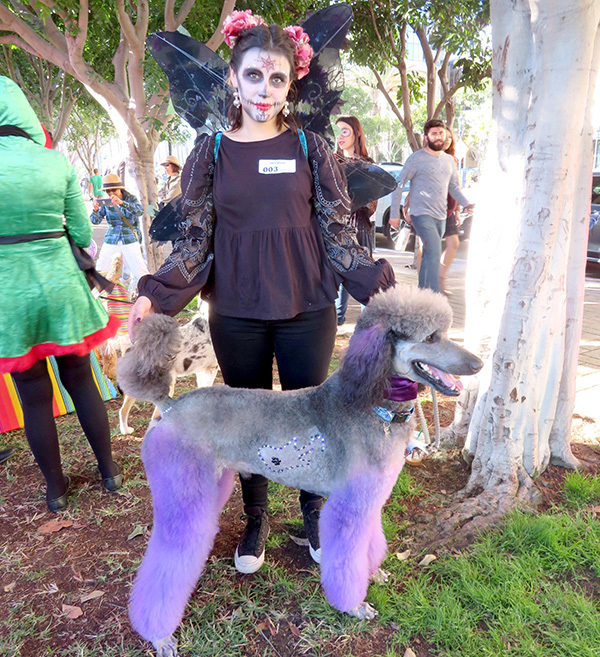 Best Costumed Group (three or more): third place — Sir Ruffles Von Vicious with handler Jan Savage; second place — Lucki, Molly, Key-Hey, Jackson, Kalani, Rothstein, Lola and Pete; and first place — Tater Tot, Hamilton, Gemma, Bismark and Chewbacca, aka Bach Dia de los Perros. Best Float: third place — Penny with handler Karen Beets; second place — Sammie, Sweet Pea, Bennie with handler Jackie Silva; and first place — Ozzie, Ferra, Cheech with handlers, Corey, Jennifer and Will. 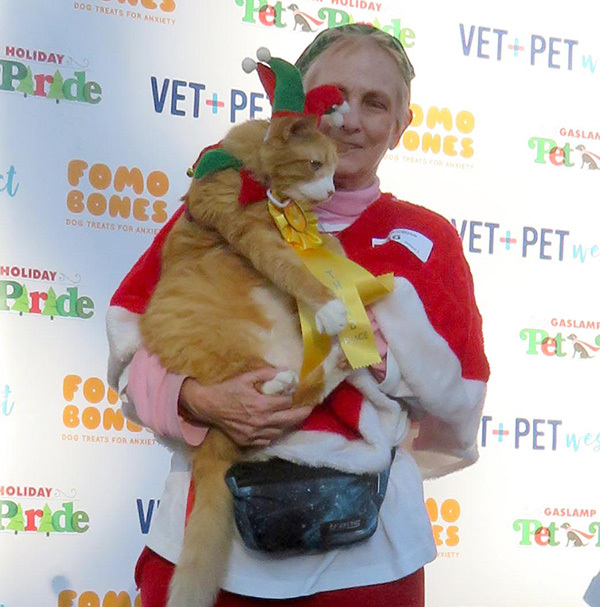 If you missed this warm and fuzzy event, stay tuned for the 2019 Holiday Pet Parade by visiting: gaslamp.org. 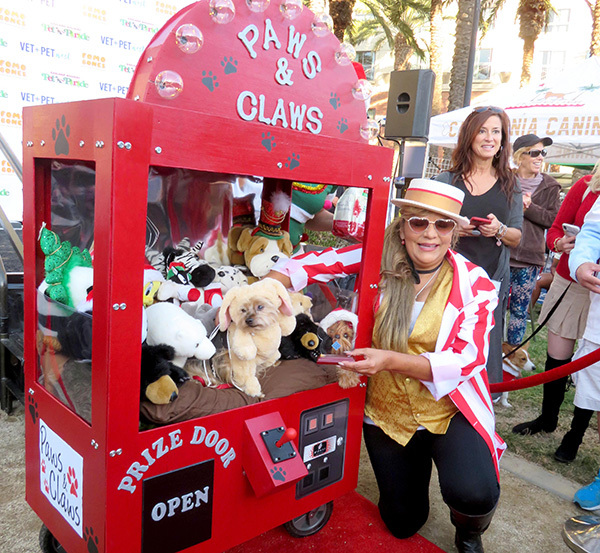 This year’s guests of the Holiday Pet Parade received free admission to Wag PetCon, which was at the San Diego Convention Center on Dec. 15-16. Everyone was encouraged to bring their pet with them to this event. There were educational and fun booths along with an adoption program for pets. Jan. 13: Winter Bridal Bazaar with fashion shows presented by Gretchen Productions at the San Diego Convention Center. Three shows presented throughout the day. For more info, call 760-334-5500.